I have already reviewed the 4.5mm Steel BB version of the ASG Bersa BP9CC and done both a Table Top Video and Field Test Video review for it so make sure to check those review video links out! 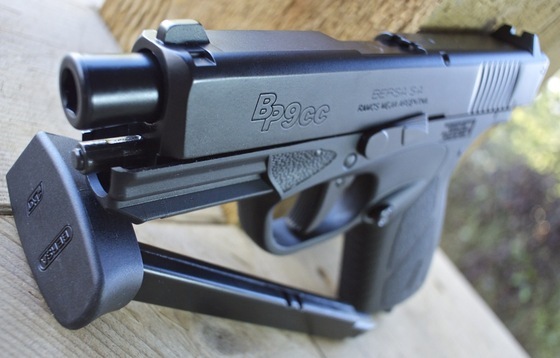 In this Filed Test Shooting videos review I take the ASG Bersa BP9CC CO2 Blowback Airsoft Pistol through its paces and test it using my Chronograph to see what kind of real world fps we can expect from it. I also perform my usual 30 foot back paper target accuracy test to see what kind of a 10 shot grouping the ASG Bersa BP9CC CO2 Blowback Airsoft Pistol will achieve. I have to be honest and say that there may have been a problem with the valve in my test unit since I was getting really inconsistent velocity readings using my Chronograph to test out the fps. I could even hear the difference in how much CO2 was being let out with each shot and even the recoil from the blowback slide was sometimes very hard and sometimes very soft. I did end up getting an average of 356 fps but it ranged anywhere from 420 right down to below 300 fps? With the extreme velocity readings I was getting I did not expect the ASG Bersa BP9CC CO2 Blowback Airsoft Pistol to be super accurate as velocity can really effect the high and low target placement but I was surprised when pretty much all the shots hit within a 3 inch group, with the excepting of a double shot that obviously shot slow and low. This double shot was a result of the slide not kicking back all the way and not reset the single action internal hammer so when I pulled back the trigger I loaded a round into the barrel but could not fire the gun. Resulting in me having to manually pull the slide back and then pull the trigger back a second time, loading a second Airsoft BB into the barrel and firing both BB's at the same time. My 4.5mm Steel BB version did not seem to have this inconsistent power problem so it may be that my gun either needed some break in time or perhaps had a faulty valve? Even so It actually performed well during the accuracy portion of the test for me.